Video, integrating both images and voice perfectly, has become the best choice to show something happening on computer screen to other people. For example, you may need to make a video tutorial for your parents or friends far away; or you may just want to display some knacks on your computer. Apple has a built-in screen recorder for Mac, namely QuickTime Player. It makes it easy to record Mac screen: open QuickTime Player X in your Applications folder, click "File," then "New Screen Recording." However, QuickTime Player can record sound of your microphone only by default. macOS Mojave available this fall brings improved screenshots tools, making it easier to record videos of your screen on Mac. You can access the screen recording function by simply pressing Command-Shift-5 instead of resorting to QuickTime Player. For users who don't want to or don't have the luck to update to macOS Mojave, or prefer an easier way, a free third-party tool called SoundFlower can help this. But this app stops updating and becomes incompatible since El Capitan. How to easily capture Mac screen with audio on later macOS with high quality and great effects? With numerous screen recorders for Mac emerging on the market, which can it becomes a headache for many users to pick out the right one. Haunted by the same question? Follow on and this article will share you the best screen capture software. Try MacX Video Converter Pro - It's as easy as click-and-capture and make a record of any screen activities like live streaming, gameplay footage, tutorials, presentations, movies. You can select the capture area or record full screen with 30fps. It also allows you to edit recordings, trim out unwanted parts, compress, split, add subtitles/watermark/effects, create GIFs, and more. When choosing the screen recorder for Mac, the real-time screen recording feature, output video quality, ease of use, and bonus features like editing would be the primary elements worth considering. 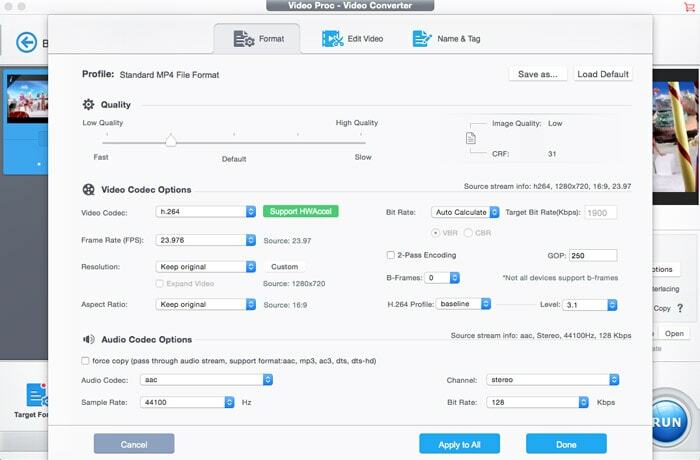 So we recommend MacX Video Converter Pro to you. Follow steps below to use this Mac video screen capture software to record a game walkthrough, presentation, tutorial, or live streaming, etc. Step 1: Free download this video screen recording tool on Mac OS (High Sierra also included), fire it up and click the Recorder button on the main interface of MacX Video Converter Pro, and the recorder window will appear. Step 2: Adjust Capture Settings. You can choose "Keep Full Screen" or click the blue "Crop" icon to customize the capture area, select the audio device used to add sound to your video, or disable audio recording completely. quality, framerate, video device and audio device. Then click the Done button to make the changes applied. Step 3: Choose the Destination folder. Click the Browse button in output setting area and select a destination folder to save your recorded video. Step 4: After finishing the steps above, click the red REC button at the bottom of the window to record screen on Mac with high quality. You also can stop the video capturing process at any time. * Split a long tutorial or presentation into separate smaller parts for sharing, uploading etc. * Trim out unwanted footage from the beginning, middle or end of the clip and merge them into a new masterpiece. * Use the Denoise feature under Toolbox category to remove background noise from the recorded videos. * Add special effects and filters to your captured videos. * Put watermark and subtitles to the recordings. 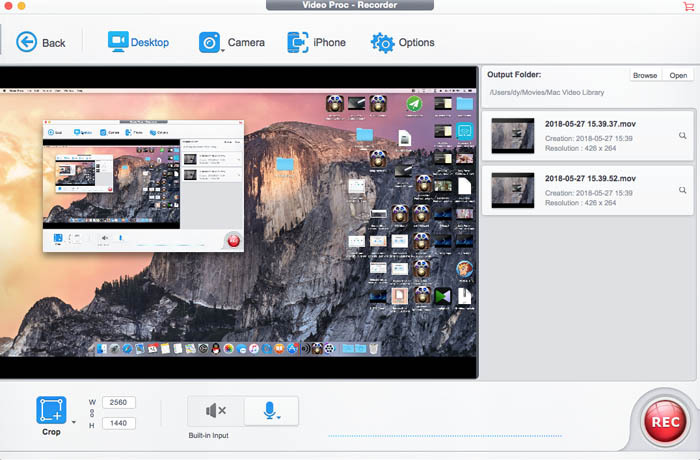 * Create GIFs and take screenshots from your recordings for various uses. What If Your Recording Video File Is Too Large? Users who record high quality screen videos for long hours on Mac may have to make the file size smaller for uploading, sharing or storing. The tool can easily compress videos on macOS. To do this, load the source file and reduce captured video size on Mac in the following ways. 1. Cut out unnecessary parts of the videos and shorten the clip, which shrinks size without losing quality. 2. Lower down the video audio bit rate a bit. You can also adjust the video parameters, such as lowering down quality and resolution. 3. Change video codec to another more efficient one. For example, HEVC delivers smaller file size at the same quality, compared to H.264. Tips: The program is also able to process, convert recorded videos and adjust parameters (frame rate, bit rate, codecs etc.) for emailing, sharing, uploading to WhatsApp, YouTube, Facebook, Dailymotion, Vimeo, Metacafe, Instagram etc. video sharing sites. 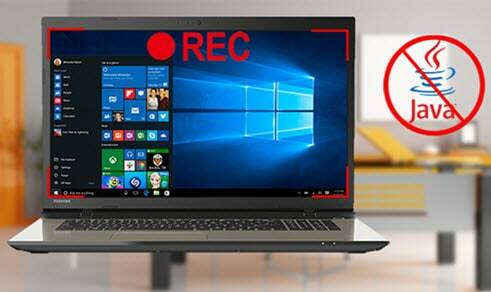 We just talked about how to record Mac screen with Mac-based screen recording software, but what if you also have a Windows computer and wanna record screen activity on Windows PC? Here the world-famous screen recording freeware called CamStudio is the one you can't miss, which can assist you to free record all screen and audio activity on your Windows PC and create AVI video fils as output video format. Plus, its built-in SWF producer can also yield SWF video files for your later playback. And if you consider AVI and SWF incompatibility issue with your mobile device as a big deal, you can resort to MacX HD Video Converter Pro for Windows to convert avi or swf to MP4, MOV, M4V, MKV, WMV, FLV, 3GP, MP3, etc. as you like. The Swiss Knife for screen recording, online video capturing and editing. Record screen activities on Mac computer with high quality and capture online videos from YouTube, Facebook, Dailymotion and 300+ online sites and edit (cut, trim, split, merge, remove noise, add subtitle/watermark/effects, compress, etc.) recordings like a pro. Use the tool to easily make slideshow on macOS. Follow to simply edit videos on Mac like a pro.